The phone will be marketed as the Nokia 6.1 Plus in the global market, instead of its original name Nokia X6. No changes, however, will be made to the technical specifications of the phone. The Finnish mobile phone company, HMD Global Oy, will introduce the Nokia X6 in Hong Kong on July 9th, as reported by Mobile Magazine Hong Kong. The device was introduced in Chinese markets in May, and is expected to be available globally very soon. The phone dons a 5.8-inch Full HD+ display with a notch on top. The IPS display has a resolution of 1080 x 2280 pixels and 19:9 aspect ratio, along with a protective layer of Corning Gorilla Glass 3. It is powered by Qualcomm's Snapdragon 636 octa-core processor, which is based on the 14nm process and is clocked at 1.8 GHz with an Adreno 509 GPU. It sports a 16MP+5MP dual camera setup, wherein the primary 16MP RGB sensor has an f/2.0 aperture while the secondary monochrome lens has f/2.2 aperture. The phone is equipped with AI-assisted features and technologies coupled with deep image learning capabilities. It also includes intelligent scene recognition feature alongside AI Portrait mode. It supports Face Unlock along with AR Stickers and AI selfies with bokeh effects. The Nokia X6 comes with 6GB RAM and 64GB of internal storage. It runs on a 3060mAh battery that comes with Qualcomm Quick Charge 3.0 support. HMD Global claims that the Nokia X6's battery can fuel up to 50% charge in just 30 minutes of charging. Connectivity wise, the phone supports a Dual-SIM, 4G VoLTE, Wi-Fi 802.11 a/b/g/n/ac dual-band, Bluetooth 5.0 Low Energy, GPS with A-GPS, GLONASS, and USB Type-C. It sports a fingerprint sensor at the back and runs Android 8.1 Oreo, and is eligible for Android P upgrade. 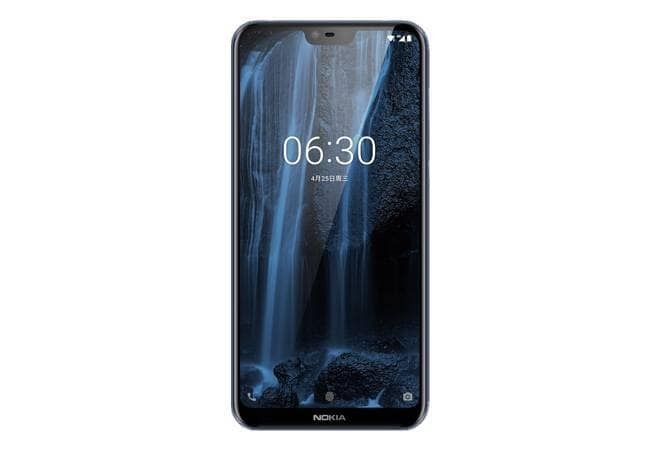 While the price of the phone has not been disclosed, the Nokia X6 can be expected to be priced under Rs.20,000, once it is available in India.